Tetrads with recent records of singing Nightingales prior to 2012 form the main search area for the survey. A survey of tetrads known to have been recently occupied by singing Nightingales forms the main part of the survey. 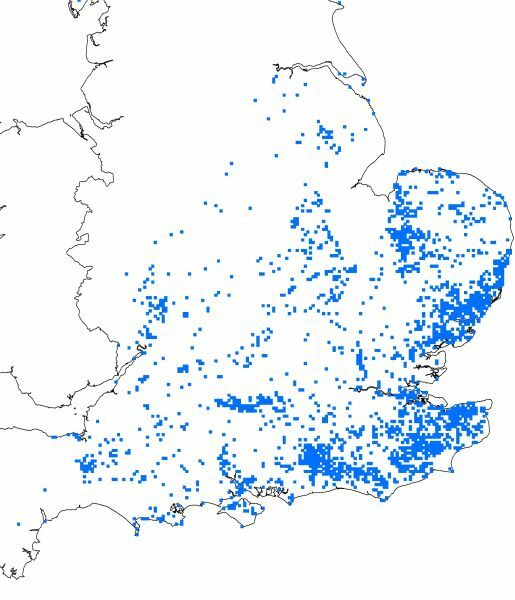 We compiled a list of 2,400 such tetrads (2 x 2-km squares of the Ordnance Survey national grid), using the 1999 survey results, subsequent records from Atlas 2007-11 and other sources and with help from BTO Regional Representatives (RRs). A few hundred additional tetrads were added, to test the likelihood that our initial list was incomplete. RRs were asked to find volunteers to visit every one of the selected tetrads at least twice during the early spring (21 April to 20 May). Each visit was to cover all suitable Nightingale habitat within the tetrad in the early morning and map any singing Nightingales onto a pre-printed survey form. Basic habitat information was requested for any Nightingale territories found. There were also optional nocturnal visits to occupied tetrads (ideally at least two during 18 May to 4 June). The main aim of these was to discover whether singing birds, already detected by the daytime surveys, are in song during the hours of midnight to 03:00, which would be indicative of unpaired individuals. Nocturnal visits are not required from tetrads found to be empty from daytime surveys. To reduce the chances of singing birds being missed by the tetrad surveys, all casual records of Nightingale during 2012 were requested to be submitted to BTO, for example via the BirdTrack pages.